Western washing powders and detergents temporarily banned in Russia. Russian retailers have started removing detergents manufactured by foreign companies such as Henkel, Procter & Gamble, and Colgate-Palmolive from their shelves after Russia's state health watchdog Rospotrebnadzor claimed that some household chemicals produced by these companies did not meet safety requirements, reports business daily Kommersant. The newspaper received a copy of a letter from Anna Popova, head of Rospotrebnadzor, which was sent out on July 28 to the agency's offices. In it, it was stated that laboratory studies conducted on household chemicals and detergents had revealed that some of these products did not meet regulatory requirements stipulated in Russian sanitary-chemical and toxicological safety standards. 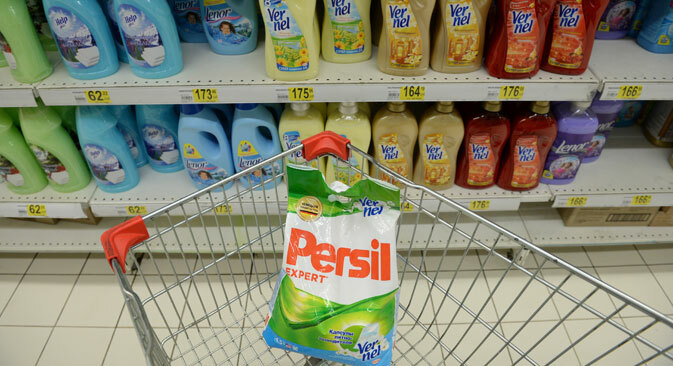 The blacklist of products includes the fabric softener Vernel, the washing powder Persil Expert Sensitive and detergent Pemos for Children – manufactured by Henkel. Also on the list were the dishwashing detergent Fairy Platinum (supplied by Procter & Gamble from the Czech Republic), Palmolive Naturel liquid soap (Colgate-Palmolive, Turkey), the German floor-care agent Emsal (Werner & Mertz GmbH), the SPA Universal and Luxus Professional UniCUM floor-cleaning agents (ESP-Kontrakt GmbH, Moscow Region), the universal antibacterial cleanser Formula 409 (The Clorox Company, U.S.), and several others. No decision has been made yet as to whether or not these products will placed on the list of products banned for import into Russia. Large chain stores, including Metro Cash & Carry and Auchan have already removed products belonging to brands by Henkel, Procter & Gamble, and Colgate-Palmolive from their shelves. Foreign companies occupy about 75 percent of the Russian detergents and cleaning products market.